Today, on the resolution’s anniversary, the National Security Archive publishes for the first time declassified U.S. government documents on developments in U.S. policy toward the resolution – from initial hostility to eventual support – including records of discussions with Aiken and other Irish officials over the resolution and its wording. According to the declassified documents, what made Aiken interested in an international nonproliferation agreement was that if the “Nuclear Club” grew larger than four members (U.S, U.K., Soviet Union, and prospectively France), “control over nuclear weapons will have become impossible,” and the probability of nuclear conflict would increase, one that he saw increasing in geometric proportions. Aiken told U.S. 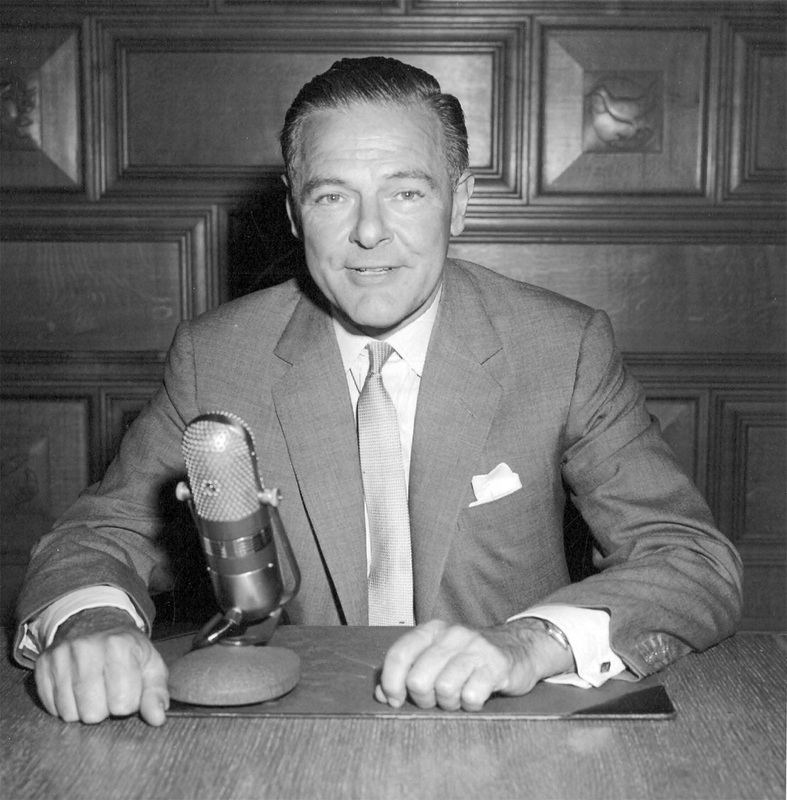 Ambassador to the United Nations Henry Cabot Lodge that a non-transfer agreement that froze the size of the “Nuclear Club” could create a “‘Pax Atomica’” and “enduring stability.” He believed that the Soviet Union would be supportive of a nonproliferation agreement because the Soviets “do not wish to transfer weapons” to China, which “would lead to loss of Russian control,” and were "terrified" of the prospect of a nuclear-armed West Germany. It was such considerations that motivated Aiken to introduce a nonproliferation resolution to the UN General Assembly each year from 1958 to 1961. By supporting nonproliferation at the UN, Aiken, an important figure in the Irish independence movement, took a step that raised his country’s “international profile as a small but confident actor on the world stage.” A major study of the resolution written in 1990 characterized it as an “historic landmark”: equivalent to the first draft of the NPT because it required the nuclear weapons states not to proliferate nuclear capabilities and non-weapons states not to acquire or produce nuclear weapons. Another study underlines Aiken’s importance in bringing the dangers of nuclear proliferation squarely before the United Nations and by differentiating the goal of nuclear nonproliferation from nuclear disarmament. Aiken treated nonproliferation as an objective that had to be pursued separately, but that was also a step toward more sweeping measures to reduce and eliminate the nuclear danger. Not wanting to cast a negative vote that could damage the U.S. image, Washington abstained from the General Assembly votes in 1958 and 1960. In 1959, however, it supported Aiken’s resolution because it was procedural in nature and did not require specific U.S. approval of the content. The text referred the problem of nonproliferation to the U.N.’s 10 Nation Disarmament Committee which would study it and make recommendations. In 1960, Ambassador Lodge recommended support of the resolution because the language was more consistent with U.S. policy but the State Department turned his advice down. By contrast, the Kennedy administration, also deeply concerned about nuclear proliferation, was more willing than its predecessor to work with Aiken on the text of the resolution. It recognized that he was not trying to undermine U.S. nuclear deployments and nuclear sharing arrangements with NATO countries. Indeed, Aiken was willing to accomodate to NATO interests to win the support of the United States and other alliance members. For Rusk’s State Department some tweaks in the language were enough to satisfy NATO interests. One change related to the responsibilities of the nuclear powers: by changing not to “give” nuclear weapons to non-nuclear states to “not to relinquish control over” nuclear weapons. Nevertheless, the Dutch and other key NATO allies strongly lobbied for an additional tweak before they could vote for the resolution. 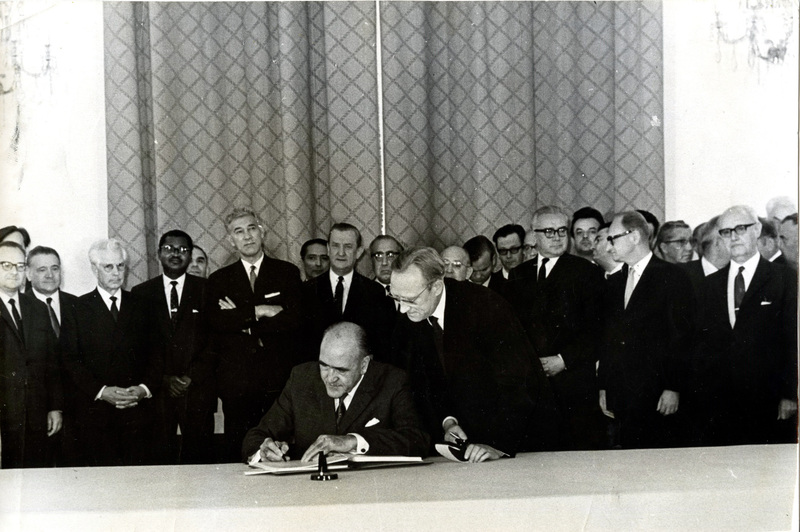 Thus, in the language about the responsibilities of non-nuclear weapons states, the Netherlands proposed adding a word to the phrase: “calls all states not possessing nuclear weapons to undertake not to accept or make such weapons.” The British proposed, with the support of the Dutch and other NATO allies, inserting the word “control” after “accept.” The phrase “accept control” (with appropriate stylistic modifications) would protect nuclear sharing arrangements because it was the United States, not the non-nuclear NATO partners, that had custody and control over the use of the weapons. The U.S. and the British proposed “accept control” to the Irish and Aiken agreed. The Irish resolution had competition: a nonproliferation resolution proposed by the Swedish government, which Washington opposed because it included language that was incompatible with NATO nuclear stockpile arrangements. While Moscow supported and Washington opposed the Swedish resolution, both voted for the Irish resolution; it was the first time they voted the same way on an arms control issue at the United Nations, Cold War tensions over Berlin and other issues notwithstanding, Their support for the resolution, passed by acclamation at the General Assembly in December 1961, was a portent of future U.S.-Soviet understandings on nuclear test bans and nuclear nonproliferation, among other issues, although it would take a dangerous crisis over Cuba to make both sides more interested in such understandings. The Nuclear Nonproliferation Treaty negotiated seven years later embodied the basic principles of the Irish Resolution, including treaty language tailored to accommodate U.S. nuclear deployments in NATO Europe. 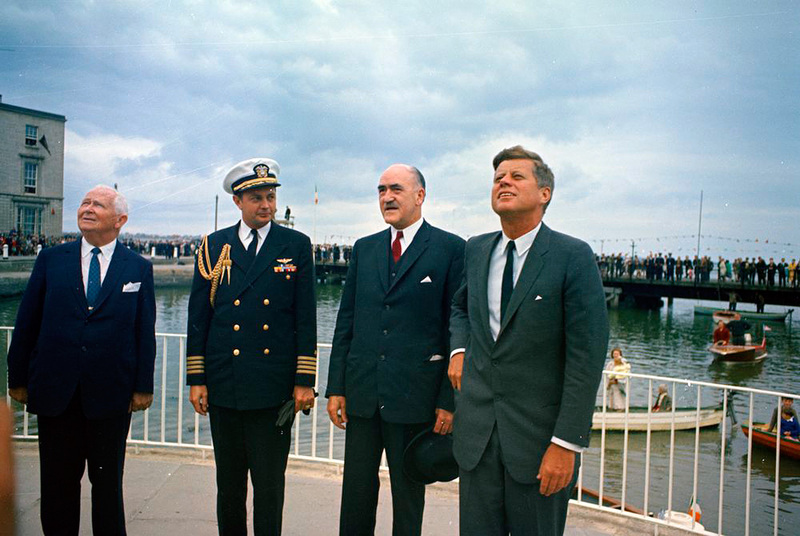 Ireland’s contribution to nonproliferation policy was evident at the three NPT signing ceremonies held on 1 July 1968 in Washington, London, and Moscow, with Irish diplomats attending all three. Frank Aiken was the first minister to sign the Treaty at the Moscow ceremony, later presenting Foreign Minister Andrey Gromyko with Ireland’s instrument of ratification, making Ireland the first country to ratify the Treaty.
. Catherine Manathunga, “The Evolution of Irish Disarmament Initiatives at the United Nations, 1957-1961,” Irish Studies in International Affairs 7 (1996), 97-113; Evgeny M. Chossudovsky, “The Origins of the Treaty on the Non-Proliferation of Nuclear Weapons: Ireland's Initiative in the United Nations (1958-61),”Irish Studies in International Affairs 3 (1990): 116; Jonathan Reid Hunt, “Into the Bargain: The Triumph and Tragedy of Nuclear Internationalism during the Mid-Cold War, 1958-1970,” Ph.D. dissertation, University of Texas, 2013, 30. For a Soviet proposal that anticipated the NPT’s verification features, see Elisabeth Roehrlich, “Negotiating Verification: International Diplomacy and the Evolution of Nuclear Safeguards, 1945–1972,” Diplomacy and Statecraft 29 (2018): 33. For Aiken's life and times generally, see Bryce Evans and Stephen Kelly, eds., Frank Aiken:Nationalist and Internationalist (Sallins, Ireland: Irish Academic Press, 2014).
. Roland Popp, “The Long Road to the NPT: From Superpower Collusion to Global Compromise,” in Roland Popp, Liviu Horowitz, and Andreas Wenger, eds., Negotiating the Nuclear Non-Proliferation Treaty: Origins of the Nuclear Order (Abingdon: Routledge, 2017), 12-13.
. Shane J. Maddock, Nuclear Apartheid: The Quest for American Atomic Supremacy from World War II to the Present (Chapel Hill: University of North Carolina Press, 2010), 172-173.
. Hunt, “Into the Bargain,” 44; Noel Dorr, “How Ireland Sowed Seeds for Nuclear Disarmament,” Irish Times, 10 April 2010.
. Zhihau Shen and Yafeng Xia, Mao and the Sino–SovietPartnership, 1945–1959: A New History (Lanham, MD: Lexington Books, 2015), 205-240.
. James Goodby, The US Arms Control And Disarmment Agency in 1961–63: A Study in Governance 18 July 2017, Hoover Institution.